New! 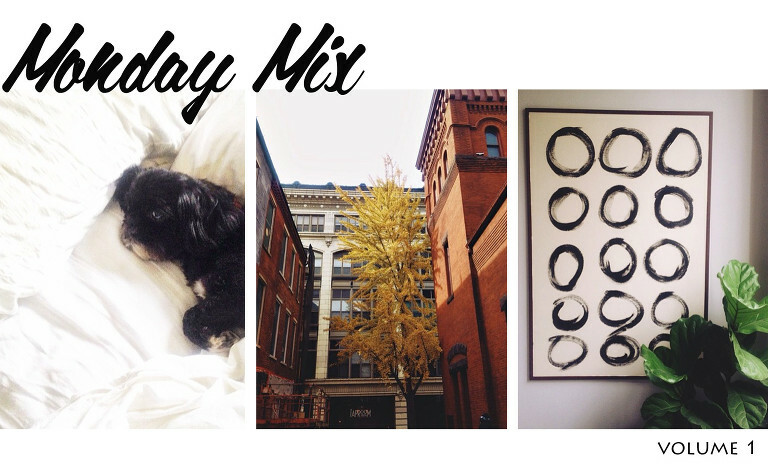 The first Monday Mix! – Be still my heart. I know this adorableness is everywhere now, but just in case you didn’t see it yet. Puppies and kids are the best photo combination ever (if you happen to have both at the same time, um, please call me). And on the topic of sleepy puppies, Luke decided to sleep in this weekend. I was up at 7:30 but he slept in until 9:30 as you can see above. He has quite the life. – I think Lancaster city is the most beautiful in the Fall. The above instagram photo is one of my favorite trees in the city. I really love living here and being able to walk to so many great cafes and restaurants. A new cafe/market opened near me called Roaring Brook Market. So if you like dried cranberries, they have the most delicious ones ever. And they come in glass jars! – Thanks to the iheartradio app and the “Relax Your Inner Indie” playlist I have discovered Little Green Cars (I like number 2 and 3 from that list the most) I’m also obsessed with The Voice this season. James and Matthew are my favorite (both from PA!) James’ version of Love Interrupted and A Case of You plus Matthew’s Cosmic Love and Hallelujah are just a-m-a-z-i-n-g.
– I finished Stephen King’s book On Writing. I normally don’t read any SK but this one was fascinating and not scary (watching IT when I was 12 wasn’t the best idea I’ve had.) I’m just starting The Book Thief (the kindle version is only $2.90!) and I’m excited. Plus, the movie is opening soon and I’ve heard good things. – I’m not rushing the snow but check out these macro photographs of single snowflakes. I’m just amazed at the detail of something that melts instantly. God is quite the artist.